This has been a rough year in terms of natural disasters. Images have flooded our televisions, Facebook ads, and YouTube accounts with visions of planet-wide tragedy. People from all over the world have come together to donate money to charities to help those in need, including gamers! When the earthquake struck Haiti in January DriveThruRPG created a bundle that contained donated RPGs from 100 publishers. This bundle contained several hundred dollars worth of gaming material, but DriveThruRPG charged a mere $20. All proceeds went to Doctor’s Without Borders in an effort to help with the relief fund in Haiti. When I first learned about this, I was shocked to see how much money had been raised in such a short amount of time. My husband and I purchased this bundle, and received an email that basically said that due to the overwhelming purchases of the bundle, it would be a few days before we received the download links for the package. It was at least 3 days later before we were able to download any of the games for personal use. Gamers from all over the world came to DriveThruRPG and purchased their bundle for a good cause. True, they got a steal on the amount of games they were buying, but hey, it was for a good cause! When it was all said and done a total of $178,900 was wired to Doctor’s Without Borders. In the video game arena, indie developer Wolfire Games, released something very similar, and had an amazing outcome. The Humble Indie Bundle includes: World of Goo, Aquaria, Gish, Lugaru (in HD), Penumbra: Overture, and Samorost 2. What’s Wolfire’s charity of choice? Child’s Play , a game industry charity dedicated to improving the lives of children with toys and games. So far, Child’s Play has had an amazing $1.7 million dollars donated since 2003 from gamers across the world. In the few short days that Wolfire had their Humble Indie Bundle out there for gamers to download (for as little as a $0.01) 124,250 people donated $1,136,933! I’d say that the video gamers are a generous bunch too! Back to the tabletop scene, Daniel Solis has been working with donors for his [Happy Birthday, Robot!] game on KickStarter It’s a brilliant idea! Again, donors can contribute to see the game published and receive special perks depending on the level of their donation. However, Daniel took it one step further. He decided to donate copies of [Happy Birthday, Robot! ], to different gaming organizations, schools, and libraries across the world, because his original goal was exceeded very quickly. Once the book is published, he will be donating 3 books to the organization Kids Need to Game . He will also be sending copies of the book to ten different libraries and schools to help foster role-playing and storytelling in the classroom. This entire project has been backed by generous gamers across the world, and thanks to them as well as Daniel, students will be given the chance to play this game in their classroom. Finally, on a more personal note, thanks to the generous donations of a number of indie game designers, my classroom of 4th graders where able to finish their storytelling unit by creating their own hardbound storybooks. Being the end of the year, funding at my school was running short and there were no available funds to purchase storybook kits for my students. Thanks to the power of social networking sites like Twitter and Facebook, I was able to get enough money donated to purchase 26 kits and pay for express shipping. I did have friends and family members donate, however, the bulk of the money came from indie rpg designers and enthusiasts. My heart goes out to them for their overwhelming donations, and my students are just as grateful. We all know that there are a lot of stereotypes about gamers. Gamers are perceived as being nerdy, obsessive, socially awkward, and childish. But, while we’re generalizing, I think we need to add “generous” to that list. Grab ye land while you can! Back in March I attended a small convention with my husband to promote the games that we publish. 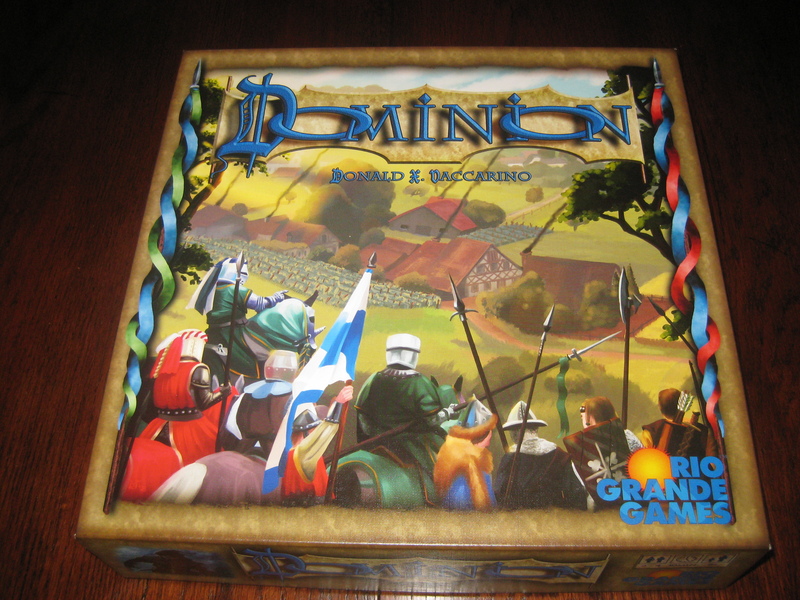 None of our demo games got off the ground that day, but as a result we were able to play our first game of the card game Dominion. I had heard/read several positive things about this game before playing it, and I was extremely happy to give it a shot. After our first round, my husband and I both came away very excited. Several weeks later, we purchased the game from our local game store, and have had quite a few fun sessions since. Before playing, we like to set the area up with some of our comforts. The most important thing to have is an episode of Coast to Coast AM streaming off the laptop. We like to listen to the older episodes with Art Bell. This adds a nice atmosphere to our evenings. We also like to gather some yummy snacks: hummus and warm pita bread, cookies, popcorn, anything that we can eat easily while we play (usually with soda or coffee to wash it down). In the game, you play a noble that is trying to gain land rights after the death of a king. 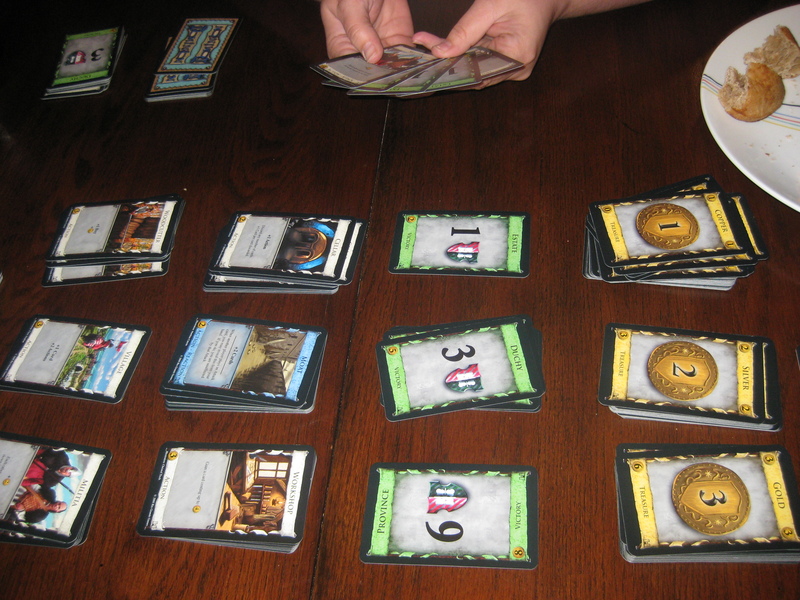 Throughout the game, you are constantly purchasing new land and assets (the cards) to build up your dominion (your deck). The winner is the person who has the most victory points at the end of the game. The turns in this game go extremely fast, especially with only two people. Once Clint and I got into the groove things started to really pick up. Because the basic game doesn’t involve much player interaction, it always interesting to see who is going to have the most victory points in the end. There are 3 basic forms of victory points (VP), estates (worth 1 VP), duchies (worth 3 VP), and provinces (worth 6 VP). Each VP card ranges in cost from 2 treasure to 8 treasure. Throughout the game, you are trying to get enough treasure in your hand that you can grab those precious VP cards. The designer of the game did a great job of making sure the turn sequence was simple. The turn sequence is as simple as A,B,C,D. A is for Action. On each turn you get 1 Action. Depending on which card you play, you can end up with more. Ultimately the more Actions that you can get in a turn the better, because you might be able to get more money in your hand. Money is important for the second phase of your turn. B is for Buy. Much like your Action phase, you get 1 Buy a turn, that is unless you have a card in your hand that gives you addition opportunities to buy. Buying is good! Buying allows you to purchase more action cards as well as VP. Even if you have additional buys, but you don’t have the funding to purchase anything, you can pick up a copper piece for FREE! More money in your deck means more chances to get those precious VP. There are several cards that allow you have extra Buys. In the rules, there are suggestions of which cards to use, for which type of game you want to play. There is a basic set for those learning the game, there is a money rich set, which floods the field with money, and various others. You can also randomize the cards that you’re playing with. Doing this can cause some interesting combinations in play. Especially, when you get used to playing with a certain card, and then that card is no longer in the sequence. It forces you to rethink your strategy in the deck building process. Much of the game’s replay appeal comes from the desire to keep refining your strategy from game to game and building more and more efficient decks. The awesome thing about this game is that it is intended to last about 30 – 45 minutes, depending on the number of players. 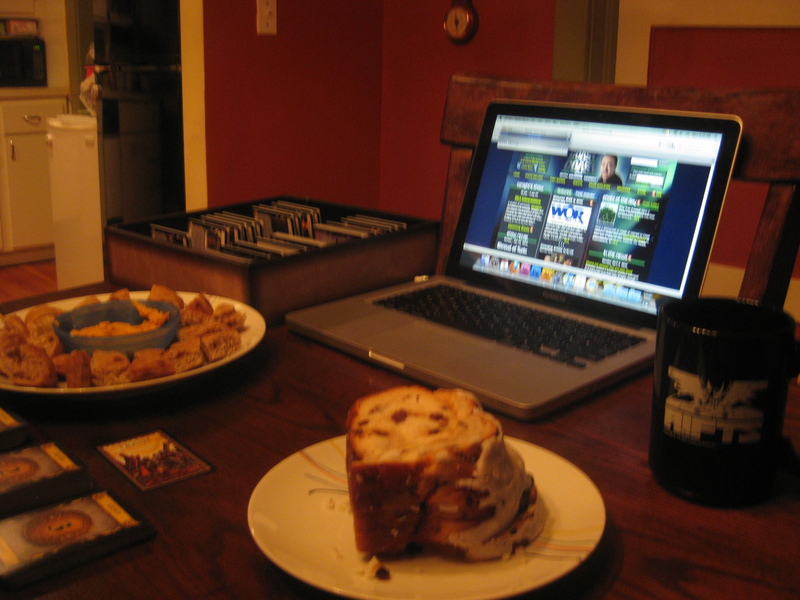 Our games have typically lasted about 30 minutes, allowing us to play several games in an evening. Ultimately, this game provides hours and hours of replay without causing much of an issue. If you do get bored with the basic set, you can purchase one of the expansion sets and add even more cards into the mix. The plus side of having the expansion is that it allows for 6-8 players instead of the 2-4 in the basic set. The basic set runs about $45, and it’s $45 well spent! We have a game we can both agree on, and we’ve enjoyed several relaxing evenings together.